Ain't That Sherific? : Knock off . . . Knock off . . .
My brother moved into a new apartment yesterday and my mom and I helped. It is a cute apartment and made me long for being single again . . . not really hubs! *wink* He mentioned needing some art for the living room and I told him I would make something. 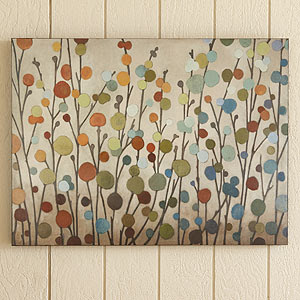 I love this canvas from World Market. I like the color and the vertical lines in it. I also love polka dots so this fill that bill too. With a price tag of $129 I figured it would be fairly simple to recreate for much, much cheaper. I like the progression in this one of the colors, but I decided to make mine consistent colors across the whole painting. I started with 2 16x 20 canvases that I bought at the Mart of Wallls for only $7.97. I bought some acrylic paint because I wasn't quite sure what I had at home and I didn't want to make another trip to the store. The paints were $1.27 a piece. I also used some circular pouncers that cost $3.97. I already had a brown paint pen at home, but you could easily do them stems with brown paint and a brush. Obviously the first thing I did was draw the stems. I simply drew them with the paint pen. When I was done I went back and added some bulk to the stems and added a bit of a triangle at the tips. You can see the original lines on the right and the finished stems on the left in the picture below. I did not want the colors pristine. I wanted the colors to be combinations and have some depth, so I simply worked them together while I was working. You will see the original colors squirted out in the first picture below and then the mess after I was finished painting. I didn't even wash my pouncer out between colors, I just added and added and got a mixed effect for the spots. Here is the finished project as it is drying. I am pretty sure I an going to add a bit of an antiquing effect to the canvas so it is not sao white, but that frightens me! I am afraid I am going to ruin it so who knows. It depends on how brave I feel later. Okay, so I went for it and tried to tame it down a bit. I used a tan paint I had and dipped a paper towel in it. I ran the papertowel through the water and squeezed it out into a container then I just wiped the papertowel on the canvas. I then took a dry towel and wiped over it all adding a bit more paint on the corners and edges. Here she is. I am not sure you can see the antiquing, but it helped a lot! Not bad for under $20! HOLY COW! I love this! You are fantastically talented in the arts Sheri. I think I am going to try to copy yours if you don't mind. How cute is that! And it looks easy the way you describe it! Who knows, you may have inspired me to try it, too! Yup....just might have to try that. You just may be in the wrong business! LOL. That looks great! I am so jealous! I haven't got a creative bone in my body! Sheri, that's gorgeous! Just one more area of life in which you're an inspiration! That is fantastic! You have some talent there missy..